Is the rug you love either too small or perhaps too large for your room? That’s a real problem when you are arranging the décor. Maybe you’re thinking you’ve got to just nix the area rug and go in a different direction. THINK AGAIN! We put a lot of time and effort into decorating our homes and making everything come together to look just the way we want. For all the time that we spend in our homes, for all the company that comes to visit, we want our homes to look BEAUTIFUL! This includes the stunning area rugs that are chosen for our floors. Ruthie here with Arizona Oriental & Specialty Rug Care and I thought I would take a moment today to talk about the importance of area rugs making sense in your home. Finding an area rug that both looks great and perfectly complements the other colors in the room isn’t always the easiest thing in the world, but when you do find that perfect rug, you also have to consider the size of the rug. 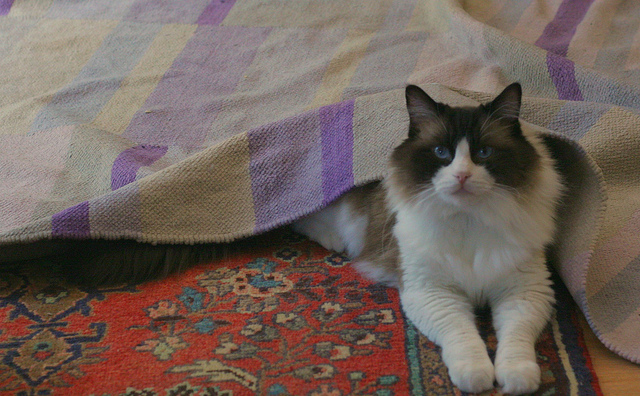 If your chosen rug is a little small for your room I’ve got an idea…………. TRY LAYERING! Yup, layering rugs, one on top of the other for a fun, fresh look. This is a look that’s been gaining a lot of traction in the interior design world lately and I have to agree, it looks fabulous. Placing a smaller rug on top of a larger rug suddenly changes everything and the rugs as a pair may just fit the room perfectly! The larger rug acts like a border to the smaller rug. What fun! You get to choose the border to your small rug. The larger area rug can be used to compliment the design in the smaller rug and really pull the whole room together plus you’ve just solved your problem of having a rug that was too small. Decorating with rugs can be so much fun! By just letting your imagination run away a bit, you might just be creating the next “to die for” magazine rage, or perhaps just be the envy of your friends!